As an alterative provision that works with children and young people who are struggling to cope in school, we build strong relationships with the students we work with. Some of the young people are with us for several years until they reach the end of year 11 and finish school – but when they leave their school they leave us too. This year we were privileged to be able to take on two ex-students as apprentices and continue to support two young men that we believed had the potential to be excellent employees. Tom and Cam are in a fantastic position to relate to the students having been in their situation just a few years ago. 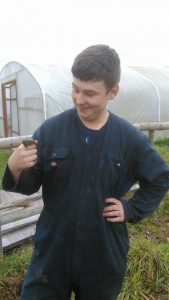 Tom joined us in September as a youth and children’s work apprentice. At the start of the year he received training from Bonterre to help him work with the children we support and he receives regular supervision with a more experienced colleague so he can discuss the best strategies to help him deliver the high standard of educational provision we provide. In addition, he is following a course with Heart of Worcestershire College so that he can bring the latest ideas and methods to us, keeping us at the leading edge. The young people we work with love Tom. He is fit and active enough to play the liveliest games on our 15 acre small holding but also skilled in working quietly in a one to one capacity with students, gently coaching, encouraging and congratulating them as they work on a carpentry project or carrying out tasks on the farm. One of our key aims, is to help children and young people improve the way they interact with other people and deal with disagreements or confrontation. It is a pleasure to see someone who was once a student now calmly and confidently helping our current students make better choices to deal with difficult situations. 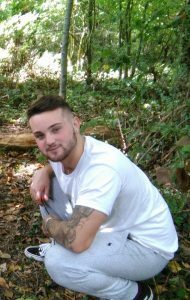 Cam also joined us in September, having finished year 11 in the summer, and is working as a horticultural apprentice in conjunction with Pershore College. Cam left school without any qualifications having spent little time in school in his final years, however at Bonterre he was a different person and showed a real passion for farming. We were delighted to be able to employ him and give him a chance to earn a living doing something he loves. All apprentices must have GCSE level maths and English qualifications and we are able to support Cam achieve this by providing him with daily lessons with a our own qualified teacher who joined us this year. Although Cam mostly looks after the orchards, polytunnels and crops, he interacts brilliantly with the children. Cam is able to provide straight talking advice to students who are behaving in ways he was just a few years ago. We are incredibly proud of both of our apprentices and the excellent work they do making Bonterre a brilliant educational provision for children and young people with a range of conditions such as ADHD and autism.